Seth P. D. Riley, Jeffrey A. Sikich, Eric C. York, and R. M. Sauvajot. Santa Monica Mountains National Recreation Area, National Park Service, 401 W. Hillcrest Dr., Thousand Oaks, CA 91360. Urbanization results in the widespread loss and fragmentation of natural habitat and can have substantial effects on wildlife, particularly for wide-ranging species such as carnivores. The largest carnivores, such as mountain lions (Puma concolor), represent the most difficult challenge for wildlife conservation in fragmented urban areas because they have the greatest spatial needs and may also come into conflict with humans. 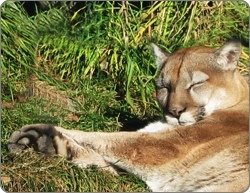 Although there is increasing interest in the relationship between mountain lions and human development, to date few studies have focused on pumas in urban areas. 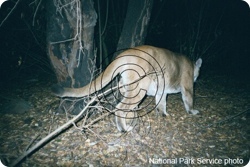 Since 2002, we have been studying the behavior, ecology, and conservation of mountain lions in and around Santa Monica Mountains National Recreation Area, a national park next to Los Angeles. Roads and development have affected lion movements as lions have learned to reach isolated fragments of habitat and to use underpasses to cross freeways and secondary roads. Mountain lions apparently do find and utilize narrow habitat corridors, including passageways across major roads. The barrier effects of development can also lead to long-term population isolation and gene flow reduction, a significant conservation concern. Although mountain lions may frequent areas near development and human activity, interactions are extremely rare and mountain lions continue to hunt native prey (primarily mule deer, Odocoileus hemionus). Recently, two mountain lions in the Santa MonicaMountains area died from anticoagulant poisoning that they may have acquired by preying on coyotes. In general, the persistence of mountain lions in urban fragmented areas will depend on reducing human-caused mortality sources and ensuring that sufficient habitat and connectivity remain. Our results suggest that people can live and recreate near lions along the urban interface, but that a human willingness to promote conservation and coexistence will be necessary for long-term mountain lion survival. On July 19th 2006 a mountain lion in the Santa Monica Mountains, was fitted with a Tellus Remote GSM collar. This animal is the first in North America to be fitted with a GPS-GSM collar. Below follows description of the communication system, and also some preliminary results of the collar performance. How does the Tellus Remote GSM collar work? The Tellus Remote GSM collar obtains GPS fixes like traditional GPS collars. However, as opposed to downloading the positions by radio signals with a UHF or VHF receiver, the collar sends the positions to the researcher using the GSM cell phone network. Built in to the collar is a cell phone modem that can send and receive text messages. One message can contain up to 8 GPS locations. The messages are sent to the Televilt server, and from there, automatically sent to the researchers by email. This is a great advantage compared to the older systems. Because the researcher gets a daily update about the animal’s location, the researchers don’t have to go out in the field to search for the animal. Included with the GPS locations, additional information such as Time to Fix, Temperature, DOP, Altitude, and Activity may be included in the text message. Also, if the animal should die, a mortality message will be sent from the collar to the researcher, giving information about time of death. It is also possible to send a message to the collar to change GPS positioning or VHF beaconing schedule. This system has been used in Europe for a few years, but has not been introduced into North America until recently. The reason is that the GSM coverage is somewhat limited in North America. However, along both the west and the east coast of the USA, the coverage is adequate. Even if the animal should be in an area without GSM coverage, the positions will be stored in the collar and sent as soon as the animal is back in GSM coverage. Because the collar is sending data on a continuous basis, it is already now possible to show some results of the collar performance. Note that this is preliminary results only, and the trends displayed below may not be statistically significant. In the three months the collar has been active (as of Oct 30th 2006), it has obtained and transferred more than 1170 successful GPS locations to the server*. Because the collar also sends information about failed fix attempts, the positioning success rate can be calculated. 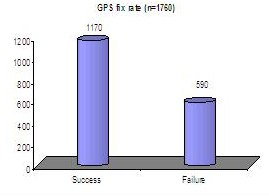 The total number of fix attempts so far is 1760, and this gives a fix success rate of 66.5% (see figure 1). It may also be interesting to look into whether or not certain factors affect the fix success rate. From the preliminary results, it seems to be a trend towards increased success rate with shorter positioning intervals (i.e. the more frequent positioning interval, the higher success rate). This particular collar is programmed to obtain fixes every hour from 1:00 to 7:00 and 9:00 to 13:00 (GMT), and every second hour from 13:00 to 23:00, and 7:00 to 9:00 (GMT). 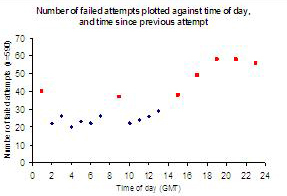 In figure 2, all failed fix attempts (n = 590) are plotted against time of day (GMT). Blue plots ( ) indicate that time since previous fix attempt is 1 hour, and red plots ( ) indicate that time since previous fix attempt is 2 hours. The data from this collar indicates that positioning success is more likely if the time since last positioning attempt is one hour, compared to two hours. A 2D location is calculated from 3 satellites, whereas a 3D location is calculated from 4 or more satellites. 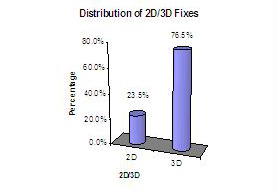 A 3D location is therefore generally more accurate than a 2D location, so it is desirable that the majority of the fixes are 3D locations. It is therefore interesting to compare the number of 2D locations versus the number of 3D locations obtained by the collar. Of the 1170 locations this collar has obtained, 894 (76.5%) are 3D locations, whereas 275 (23.5%) are 2D locations (see figure 3). The maximum GPS search time is programmed to 90 seconds. This means that the longest the collar will search for GPS satellites in order to calculate a position, is 90 seconds. If the collar obtains a position before the 90 seconds has past, the collar will stop the search. By analyzing the data on GPS search time it is possible to evaluate the battery life to a greater extent than preliminary estimates. Of the 1170 successful locations, the average search time for this collar has been 60 seconds. However, if the failed attempts (where the collar has spent the full 90 seconds search time) are included (n=590), the average search time is 70 seconds. 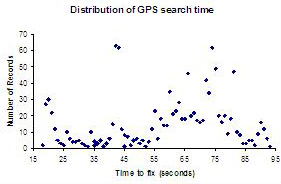 Figure 4 displays the distribution of the GPS search time. Due to relatively good GSM coverage in the study area, the collar has been able to send positions almost daily to the server. However, some parts of the study area has poor coverage, therefore it has sometimes taken a few days before the positions are transferred. The longest period without transfer has been three weeks on one occasion. All the positions that have been obtained by the collar, have been transferred successfully to the server. Below follows a brief discussion of the preliminary results. The study area is very rugged, and this, in addition to the mountain lion behavior, may explain the fix rate, as the mountain lion may spend considerable time in narrow valleys where the view to the GPS satellites is limited. The trend towards increased success rate with shorter positioning intervals is expected, because for short intervals, the collar will still have some memory from the previous position stored. For longer intervals, the collar has to download more data from the satellites, which increases the search time. The advantage of short interval is valid for up to 1.5 hours, after which the collar has to download all data from scratch. It is possible that the fix rate can be increased if the GPS search time is increased, but this could affect battery life. The distribution between 2D and 3D positions is as expected because the terrain where the mountain lion is roaming is very rugged. This leads to a poor view to the GPS satellites, and this reduces the number of satellites visible at any given time. The time to fix values are as expected, however, quite a few positions are obtained close to the 90 seconds search time, so it could be discussed to increase the search time for the collar. If this is done, a shorter battery life should be expected. The GSM coverage is quite good in the area. When the animal has been out of the area for some time, the positions are always transferred as they should. So GSM coverage does not seem to be a problem in the area. For projects that are working in areas with less GSM coverage, longer intervals between data transfer may be expected depending on the animal’s movement through the study area. * As of November 28, 2006, this number has increased to 1437 positions.